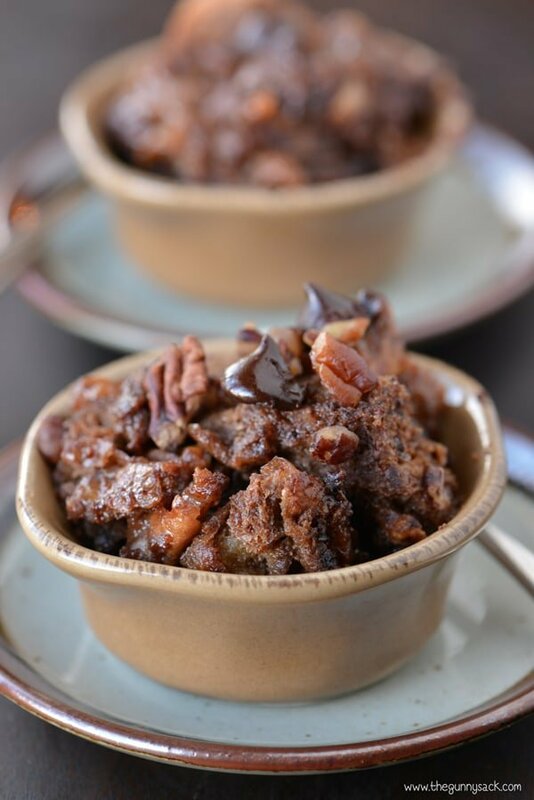 Slow Cooker Chocolate Turtle Bread Pudding is a warm, comforting dessert with chocolate, caramel, and pecans. It’s a crockpot recipe that everyone will love! You know how most kids spend their candy money on gum and candy bars? When I was a kid, I spent my candy money on those things as well, but unlike other kids, I also bought pink wintergreen lozenges, Sen-Sen black licorice mints, sponge candy and chocolate turtles. I would buy the boxes of chocolate turtles when they would go on sale during the holiday season. They are still one of my favorites and sometimes I buy them from chocolate shops. So with that in mind, I decided to make Slow Cooker Chocolate Turtle Bread Pudding. It is a warm, comforting dessert with chocolate, caramel and pecans. Of course, it tastes even better when topped with a scoop of salted caramel ice cream! To make the bread pudding, cut half of a loaf of French bread into cubes. Place 8 cups of bread cubes into a lightly greased 3 1/2 – 4 quart crockpot. 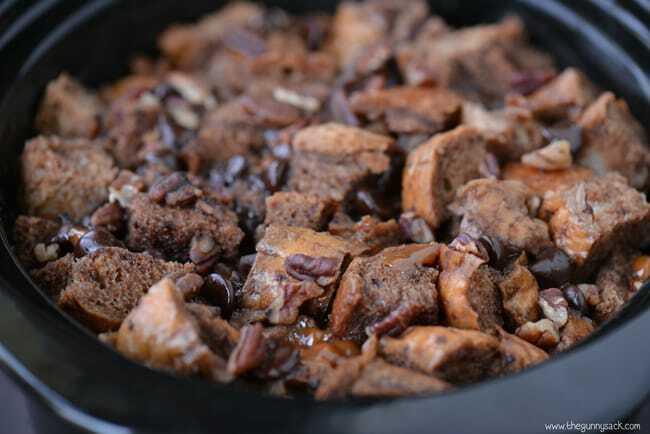 Top the bread cubes with chocolate chips, caramel bits and chopped pecans. Mix together granulated sugar, brown sugar and cocoa powder. Add four slightly beaten eggs, vanilla, strong coffee, half-n-half and milk. Mix until completely blended. Slowly pour the mixture over the cubed bread. Carefully stir until most of the liquid has been absorbed. 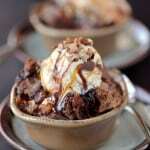 Enjoy the slow cooker chocolate turtle bread pudding while it is still warm! Top with salted caramel ice cream, caramel and chocolate sauce and a few chopped pecans, if desired. Cut half of a one pound loaf of French bread into cubes. Place 8 cups of bread cubes into a lightly greased 3 1/2 - 4 quart crockpot. Top with chocolate chips, caramel bits and chopped pecans. In a bowl, mix together granulated sugar, brown sugar and cocoa powder. Add four slightly beaten eggs, vanilla, strong coffee, half-n-half and milk. Mix until completely blended. Slowly pour the mixture over the cubed bread. Carefully stir until most of the liquid has been absorbed. Wow! This is gorgeous. 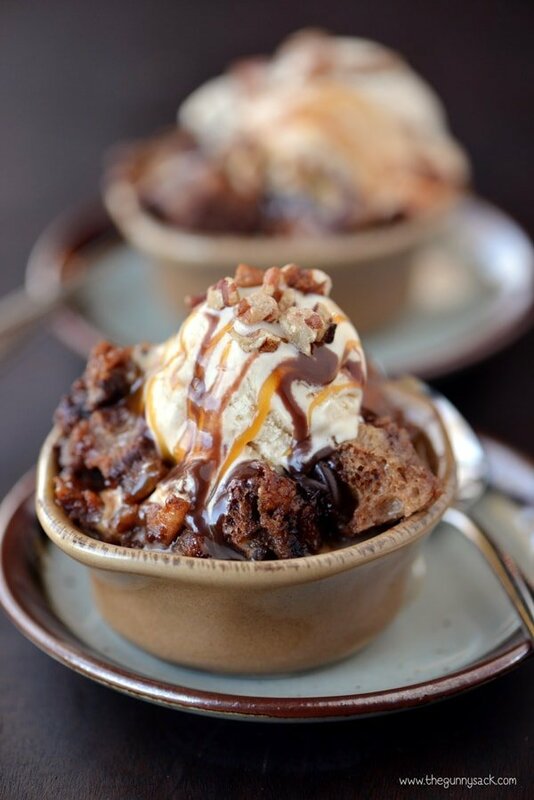 I bet they would be scrumptious chocolate turtle bread pudding amazing for kids. Will definitely try this for my family. Thanks for sharing. 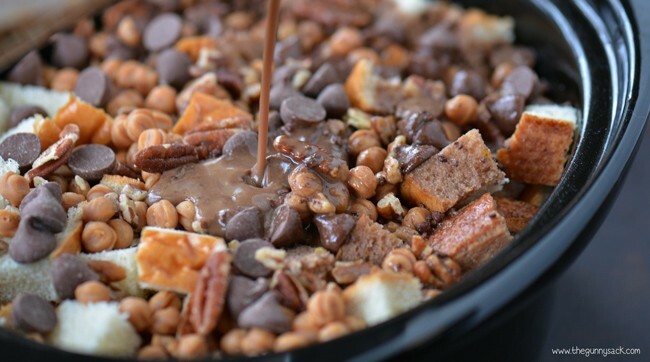 Amazing slow cooker chocolate turtle bread pudding recipe! It is very decadent, and the people in my office are happy today! Thx Tonia! I have a smaller slow cooker,9 it only holds 9 cups of water filled up) can I cut the recipe in half??? Is it covered while cooking? I used Kahlua instead of coffee and made it in a 9×13 pan and baked in the oven for our family Christmas. Smells so good while its cooking and taste even better!! This week-end it’s Thanksgiving in Canada! I just made this tonight and it was a hit!That was delicious! Thank you ! Now the big question is : Do I put the rest inside the fridge ? This looks sooooooo freaking delicious!! I have a slow cooker that my friend bought me as a Christmas gift for me and the family.This was a way for me to start trying to eat a little more healthier sense being diagnosed with diabetes,but I don’t know looking at this picture! I’ve fixed bread pudding in the oven always,never tried crock pot. Let’s hope my pudding still turns out the same as always,perfect! Could you use something in place of the coffee? We don’t drink coffee and I don’t really like the taste of it. Wow — pretty much speechless — this looks AMAZING! Could you use stale bagels instead of the bread? Is the cocoa powder sweetened or unsweetened? Also, when is the best time to eat this? Right after it’s done or wait awhile? I’m taking it to a dinner party and I’m wondering if I should cook the last hour at their house or have it done before I go. And would you transfer it to a baking dish to take? It is unsweetened cocoa powder and it is best to eat when it is done. 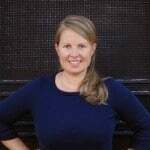 It depends on how comfortable you feel with cooking it at the home of whomever is hosting the dinner party. If I were to bring it to a formal dinner party, I would probably cook it at home, transfer it to a nicer, microwave safe dish and then heat it up in the microwave at the party. Best of luck! Hi! Do you think there’s any issue with doing this in a much larger slow cooker? Will it need to be cooked for a short amount of time? Will it come out the same? Yes you can use a bigger crock pot but I’m not sure if it will turn out the same. Also, I have read that your crock pot should be 1/2 – 3/4 full. It does seem like it would take less time in a larger crock pot. Just in case anyone is working with a larger crock pot, mine is 7 quarts so I doubled the recipe. I cooked it on low for 4 hours, then left it uncovered for about 30 minutes to let it dry out a bit. It came out great! I want to register to get these slow cooking deserts. Half and Half is coffee creamer (light cream – half milk and half heavy cream) and is sold in cartons right beside the cream and milk. Can you recommend something in place of the coffee? I want to make this Friday for a special treat for my sister-in-law on her wedding day while her and her special girls are getting ready . If I were making it, I would probably use hot chocolate or milk in place of the coffee. Best of luck with the recipe and give my congratulations to your sister-in-law! The coffee that the recipe calls for, that’s brewed coffee, correct? Thanks! It looks delicious! I can’t wait to try it! Is it Dutch-process or natural cocoa powder? I think I’m going to try it this weekend! As a kid, there’s nothing better than spending your money on candy… My favorites were Swedish fish, those caramels with the powdered sugar centers, and 3 musketeer bars. I love how decadent this dessert is, but how easily it comes together in the slow cooker. Pinned for later! For now, I’ll only have to imagine how amazing it must make your house smell! Please excuse my ignorance, but is any special brand/type of cocoa powder best for this recipe? This is the dessert of my dreams! (A)It has chocolate and caramel, (B) it’s warm, so I can slather it with ice cream, and (C) it’s made in the slow cooker. Definitely pinning! Hi, is it possible to make this without using a slow cooker. Your recipes are absolutely gorgeous? Oh my gosh, this bread pudding looks incredible!!! 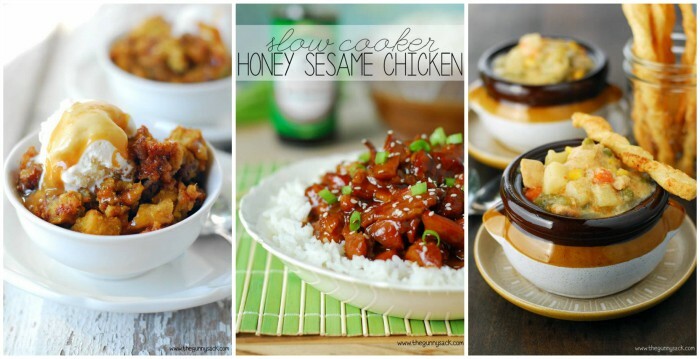 I love that you made it in the slow cooker too – I seriously can’t wait to try this. Love using my slow cooker but have never made desserts in it yet. Pinning! I love slow cooker desserts! This bread pudding looks amazing!